(Nanowerk News) Carbodeon Ltd. Oy has announced improvements to electroless nickel including a 3x improvement in wear resistance through the controlled addition of nano-diamonds. Nanodiamond particles are hardwearing, small, and offer very low surface friction. Since their discovery in cold war Russia, they have been a little-known secret used to improve the performance of hard chrome plating. 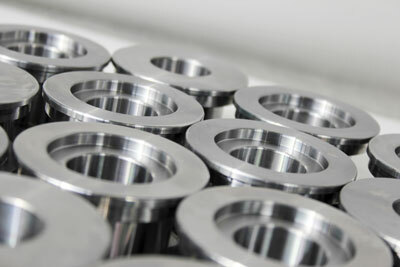 Platers have added liquid suspensions containing clusters of these diamond particles into the electrolyte and experienced significant improvements in durability of the plating for such applications as gun barrels and machine parts. NanoDiamonds are synthesised by a detonation process which results in diamond particles with surface functionalisation, enabling them to have a positive charge in solution and to deposit together with the metal ions in the plating process. Carbodeon nanodiamond particles increase wear resistance in electroless nickel plating. Carbodeon has developed modified versions of these nanodiamonds, where the surface functionalization is specifically controlled. For plating applications, the result is that the particle charge or “zeta potential” is much higher - around 50 percent more than traditional nanodiamonds. This creates an additional separation force between the nanodiamond particles and has enabled Carbodeon to develop a liquid dispersion of individual 4-6nm particles instead of the traditional clusters measuring from 100nm up to a few microns in size. The result is that the surface area to volume ratio of the diamonds increases by one to two orders of magnitude. By depositing genuine nanoscale particles into metal plating, Carbodeon aims to make the addition of nanodiamond to metal plating more economic. Carbodeon has been supplying its uDiamond nanodiamonds to the plating industry for some years, but the potential to use their newly-developed “dispersion grade” materials prompted the company to invest in a plating laboratory at the end of 2013. While the traditional dosage rate for plating with agglomerated nanodiamonds is 10g/litre of electrolyte, the optimum dose using dispersed nanodiamond in electroless nickel has been found to be just 0.05 g/litre. GDOES (glow discharge optical emission spectroscopy) shows the diamond content in the plating to be at 0.2%, and SEM (scanning electron microscope) images show the particles having to a large extent been deposited as discrete <10nm particles. Wear testing results using the Taber Rotary Abrasion method shows that the as-plated medium phosphorous electroless nickel has a wear index of 6, compared to 18 of the unmodified plating – a 3x improvement. Carbodeon is now investigating applications in a range of industries, where their aim is to supply the Carbodeon uDiamond nanodiamond materials to existing platers. Meanwhile the company’s plating lab will continue with the development of other types of nanodiamond-enhanced plating. Carbodeon is an industrial supplier of uDiamond® NanoDiamonds and Nicanite® graphitic carbon nitride. Using these materials in small quantities empowers customers to develop their own nanocomposite materials with improved or unique properties. The main applications for uDiamond® NanoDiamonds are in enhanced metal plating, wear resistant/ low friction polymer coatings, and thermally conductive polymers for electronics & LEDs.